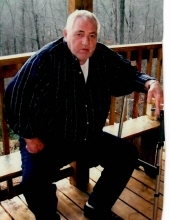 Mr. Ralph Howell Elrod, age 80 of Lakeland Drive, Toccoa, Georgia passed away Monday, November 5, 2018 at his residence. A son of the late Frank and Ruthie Mae Hart Elrod, he was born January 3, 1938 in Franklin County, Georgia having lived most of his life in Stephens County. He was a Veteran of the U.S. Army. He was a retired truck driver with American Heritage, a member of the V.F.W. Post 4346 and was of the Baptist faith. In addition to his parents, he was preceded in death by a brother, Odis Elrod, sister, Blanche Ellis, son Garvin Elrod and grandson Little Garvin Elrod. Survivors include his wife of the home, Martha Gray Elrod; daughter and son-in-law, Peggy and Gary Corley of Toccoa; two sons and daughters-in-law, Troy and Leta Elrod and Danny and Kay Elrod both of Toccoa; eleven grandchildren and thirteen great-grandchildren; brother and sister-in-law, Bruce and Kathy Elrod of Eastanollee. Funeral services will be Wednesday, November 7, 2018, 2 O’clock p.m. in the Hillcrest Chapel of the Acree-Davis Funeral Home with Mr. Mike Bramblett and The Reverend Judy Carruth officiating. The following gentlemen will serve as pallbearers, Daniel Elrod, Crandall Yearwood, Seth Fowler, Gary Corley, Kevin Gerberg and Anthony Adams. Honorary pallbearers will be William Barrett and Trenton Elrod. The family will be at the home of Peggy and Gary Corley, 1612 W. Currahee Street, Toccoa and will receive friends at the Acree-Davis Funeral Home on Tuesday, 2 p.m. until 4 p.m. and 6 p.m. until 8 p.m. Online condolences can be left for the family at www.acree-davisfh.com. Interment will follow in the Middle River Baptist Church Cemetery with Military Honors by the V.F. W. Post 4346 Honor Guard and the Georgia National Guard Honor Guard. Acree-Davis Funeral Home is in charge of the arrangements for Mr. Ralph Howell Elrod. To send flowers or a remembrance gift to the family of Ralph Howell Elrod, please visit our Tribute Store. "Email Address" would like to share the life celebration of Ralph Howell Elrod. Click on the "link" to go to share a favorite memory or leave a condolence message for the family.